2.1 How did I1 become Nordic? 2.2 How did I1 become Germanic? 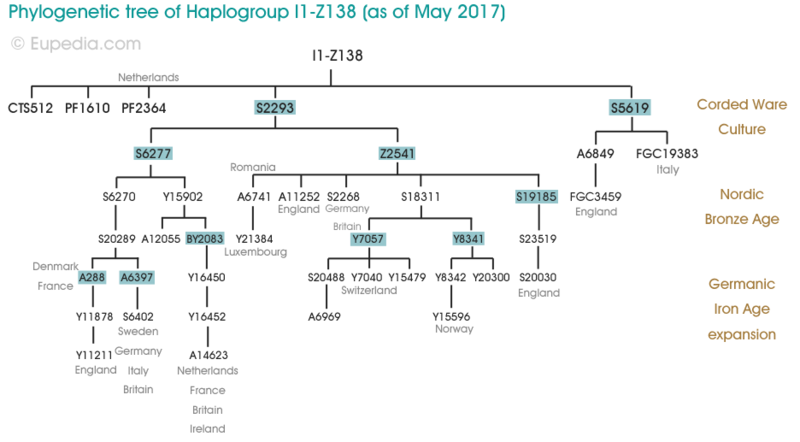 Haplogroup I1 is the most common type of haplogroup I in northern Europe. It is found mostly in Scandinavia and Finland, where it typically represent over 35% of the Y chromosomes. Associated with the Norse ethnicity, I1 is found in all places invaded by ancient Germanic tribes and the Vikings. After the core of ancient Germanic civilisation in Scandinavia, the highest frequencies of I1 are observed in other Germanic-speaking regions, such as Germany, Austria, the Low Countries, England and the Scottish Lowlands, which all have between 10% and 20% of I1 lineages. 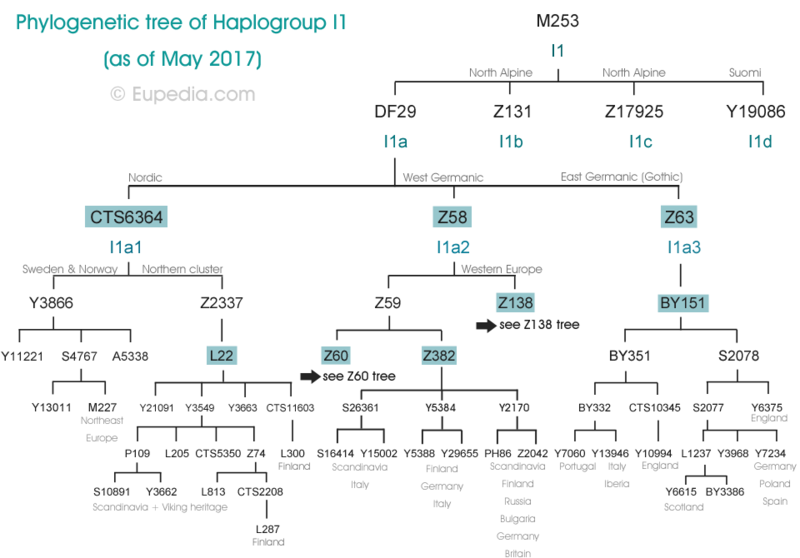 Haplogroup I is the oldest major haplogroup in Europe and in all probability the only one that originated there (apart from very minor haplogroups like C1a2 and deep subclades of other haplogroups). Haplogroup IJ would have arrived from the Middle East to Europe some 35,000 years ago, then developed into haplogroup I soon afterwards. It has now been confirmed by ancient DNA test that the first Homo sapiens to colonize Europe during the Aurignacian period (45,000 to 28,000 years ago), belonged to haplogroups CT, C1a, C1b, F and I. It is estimated that the I1 branch bifurcated from the rest of haplogroup I some 27,000 years ago. I1 is defined by over 300 unique mutations, which indicates that this lineage experienced a serious population bottleneck. Most of the Late Glacial and Mesolithic remains tested to date belonged to haplogroup I* or I2. It is not yet clear in which part of Europe I1 originated. It has been speculated that I1 evolved in isolation in Scandinavia during the late Upper Paleolithic and Mesolithic periods, when hunter-gatherers from southern Europe recolonised the northern half of the continent from their Last Glacial Maximum refugia. The oldest attested evidence of postglacial resettlement of Scandinavia dates from 11,000 BCE with the appearance of the Ahrensburg culture. However, five Y-DNA samples from Mesolithic Sweden, dating from c. 5800 to 5000 BCE and tested by Lazaridis et al. (2013) and Haak et al. 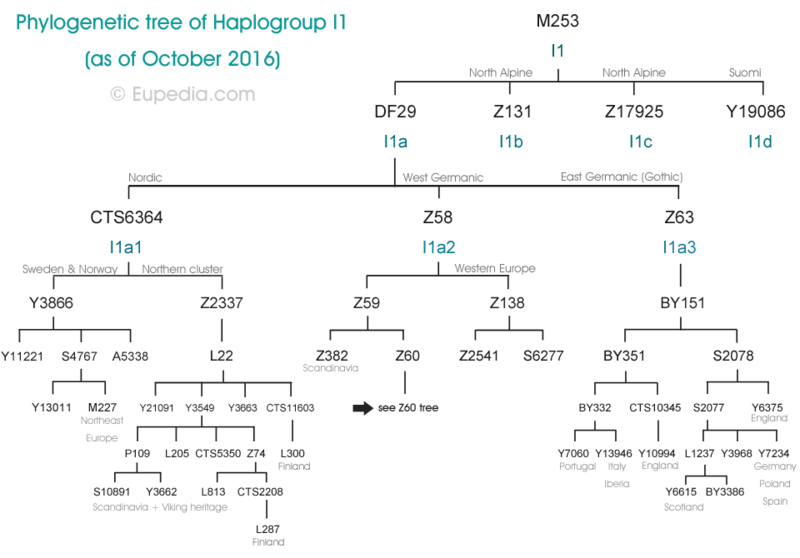 (2015) all turned out to belong to haplogroup I2. The earliest sign of haplogroup I1 emerged from the testing of Early Neolithic Y-DNA from western Hungary (Szécsényi-Nagy et al. (2014)). A single I1 sample was identified alongside a G2a2b sample, both from the early Linear Pottery (LBK) culture, which would later diffuse the new agricultural lifestyle to most of Poland, Germany and the Low Countries. This means that haplogroup I1 was present in central Europe at the time of the Neolithic expansion. It is therefore possible that I1 lineages were among the Mesolithic European hunter-gatherers that were assimilated by the wave of East Mediterranean Neolithic farmers (represented chiefly by Y-haplogroup G2a). There is also evidence from the samples of the Early Neolithic Starčevo culture and Cardium Pottery culture that haplogroup I2a lived alongside G2a farmers both in south-eastern and south-western Europe. The most likely hypothesis at present is that I1 and I2 lineages were dispersed around Europe during the Mesolithic, and that some branches prospered more than others thanks to an early adoption of agriculture upon contact with the Near Eastern farmers who were slowly making their way across the Balkans and the Mediterranean shores. The small groups of farmers from the early LBK culture in Hungary surely included a majority of G2a men accompanied by other minor haplogroups assimilated along the way over the centuries, including I1 men. Yet distinct families would have spread in different directions and met varying successes in their expansion. It would appear that a founder effect in the northern LBK population led to a sudden explosion of I1 lineages, perhaps in part thanks to their better knowledge of the Central European terrain and fauna (since hunting was typically practised side by side to agriculture to complement the farmers' diet). I1 would later have spread to Scandinavia from northern Germany. This data is consistent with a Neolithic dispersal of I1 from Hungary with the LBK culture and the subsequent Funnelbeaker culture (4000-2700 BCE) in northern Germany and southern Scandinavia. One Swedish sample from the late Mesolithic Pitted Ware culture (3200-2300 BCE) also turned out to belong to I2a1 and not I1. Both the Funnelbeaker and Pitted Ware cultures represent a merger between the Neolithic (farming) and Mesolithic (hunter-gathering) lifestyles. Neolithic farmers from Germany penetrated late into Scandinavia and in small numbers. There is archeological evidence that Neolithic farmers settled in southern Scandinavia and lived side by side with hunter-gatherers for several centuries during the Funnelbeaker culture. Skoglund et al. 2012 tested and compared the DNA of one Neolithic farmer and three hunter-gatherers from Sweden dating from 5,000 years ago. It turned out that the farmer was much closer genetically to modern Mediterranean people, especially the Sardinians, who are considered to be the closest modern population to Neolithic European farmers. The hunter-gatherers's DNA resembled that of modern Northeast Europeans, and perhaps even more that of the Balts, Finns and Samis than Scandinavians. Scandinavian hunter-gatherers would have adopted the new Neolithic lifestyle little by little, using pottery and keeping domesticated animals (sheep, cattle, pigs and goats) to complement their traditional diet of fishing and game hunting. The cultivation of wheat, barley and legumes was fairly limited due to the cold climate. The cold climate was actually a barrier to the expansion of farmers from the continent. This is why Scandinavians retained a greater percentage of Mesolithic ancestry than virtually all other Europeans, apart from the Samis, Finns, Balts and Russians. No ancient Y-DNA from the Funnelbeaker culture in Scandinavia has been tested to date, but it is likely that I1 really started gathering momentum toward the end of the Funnelbeaker period. It might also have been among the Funnelbeaker lineages that were most successfully assimilated by Proto-Indo-European invaders during the Corded Ware culture (aka Battle-Axe culture in Scandinavia). Most I1 individuals today share a common ancestor around the time of the transition between the Funnelbeaker and Corded Ware periods. How did I1 spread around northern Europe? So how comes that modern Scandinavians belong essentially to three haplogroups (I1, R1a and R1b) that haven't been found in Mesolithic Scandinavian samples? I1 would have been the first to penetrated into Scandinavia during the farming transition that lasted roughly from 4,200 to 2,300 BCE. It could be that the replacement of Mesolithic paternal lineages (I* and I2) throughout Nordic countries, including Lapland and Finland, started with a few farmers and stock breeders that spread around Scandinavia and through a founder effect belonged almost exclusively to I1. The alternate hypothesis is that I1 spread together with R1a-Z284 from Denmark to Sweden and Norway during the Chalcolithic and Early Bronze Age with the Battle-Axe culture. So far the earliest evidence of I1 in Scandinavia dates from the Nordic Bronze Age, with a single sample from Sweden dating from circa 1400 BCE by Allentoft et al. (2015). In the vast majority of farming societies men are the ones who inherit the land and the livestock. As wild game became scarcier, especially during cold winters, farmers would have had a definite advantage for food and survival prospects. As surely happened in other parts of Europe, women from hunter-gathering families were married to wealthy farmers. After several millennia, with agricultural land and livestock always inherited by I1 lineages from father to son, I1 became the dominant lineage, even though their maternal lines had become hybridized over time. Nowadays, according to the autosomal admixture tested performed by Lazaridis et al. (2014), Scandinavians have only a few percents more Mesolithic admxiture than Neolithic admixture. The Saami of Lapland were the last hunter-gatherers of Europe. But even they turned to stock breeding by domesticating the indigenous reindeer, better suited to the harsh local climate than cattle, pigs, sheep and goats. Reindeer domestication appears to have originated with North Asian N1c1 tribes. And indeed modern Saami are primarily N1c1 people with only a minority of Scandinavian paternal lineages (I1, R1b, R1a). The proportions between haplogroups I1, R1a and R1b among the Sami, and the age of the deep clades present in this population indicate that these haplogroups were incorporated into the Saami gene pool together relatively recently (probably in historical times, from or after the Viking age). N1c1 lineages, however, may have not have arrived that early either. 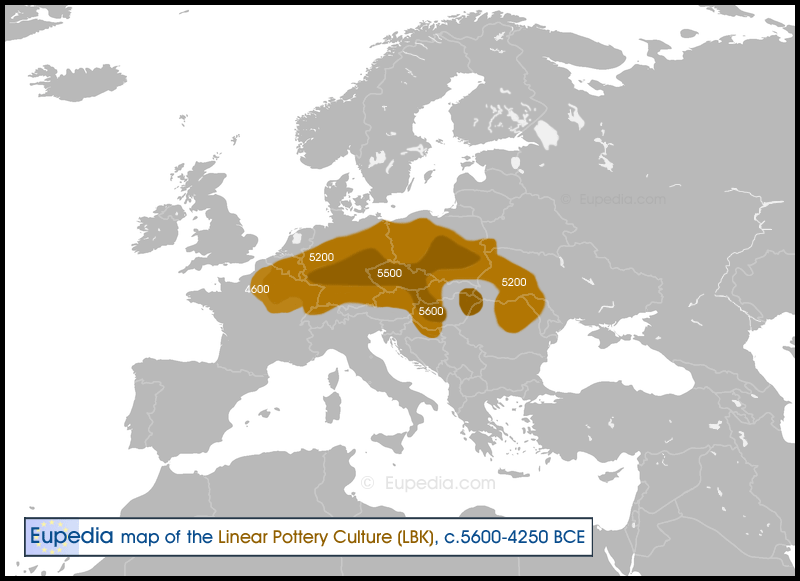 N1c1 is associated with the diffusion of the Uralic languages, which are thought to have spread to the eastern Baltic with the Comb Ceramic culture from 4200 BCE, around the same time as the Funnelbeaker culture. According to a phylogenetic reconstruction of the Uralic languages by Honkola et al. (2013), the Proto-Finnic and Proto-Samic split from each others only 2,500 years ago, and Samic dialects started diversifying less than 1,000 years ago. In all likelihood all trace of the Mesolithic inhabitants of Lapland has been wiped out on the paternal (Y-chromosomal) side, like in most of Scandinavia. 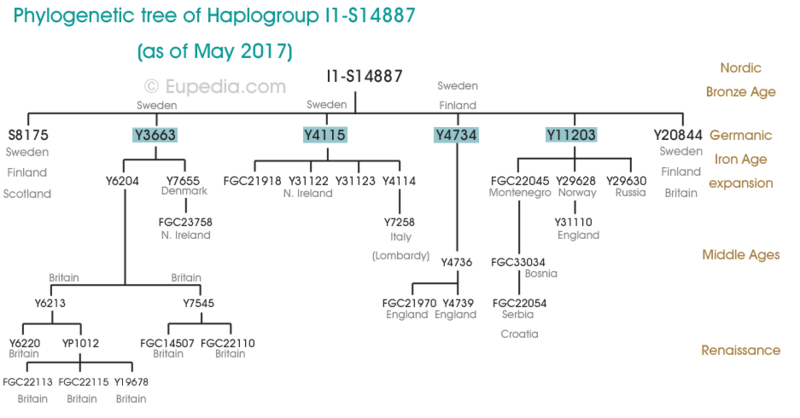 Before the arrival of N1c1 in Fennoscandia, the Nordic ancestors of the Saami would have belonged to Y-haplogroups I* and I2, and to mt-haplogroups U5b and V.
How did I1 become Germanic? From 2800 BCE, a large-scale cultural and genetic upheaval hit Scandinavia with the arrival of the Indo-Europeans from Eastern Europe, who introduced the Copper Age and Early Bronze Age to the region practically without Neolithic transition. The first Indo-Europeans to reach Scandinavia were the Corded Ware people from modern Russia, Belarus and Poland, who are thought to have belonged predominantly to haplogroup R1a, with a minority of R1b and I2a. These people shared some similar maternal lineages as Scandinavian I1 inhabitants, including mtDNA haplogroups U2e, U4 and U5, but also brought many new lineages such as H2a1, H6, W and various subclades of I, J, K and T.
The second major Indo-European migration to Scandinavia was that of haplogroup R1b-U106, the branch that is thought to have introduced Proto-Germanic languages, as an offshoot of the Proto-Celto-Germanic speakers from Central Europe. R1b probably entered Scandinavia from present-day Germany as a northward expansion of the late Unetice culture (2300-1600 BCE). The oldest known R1b sample in Scandinavia dates from the Nordic Bronze Age circa 1400 BCE (see Allentoft 2015 above). According to the Germanic substrate hypothesis, first proposed by Sigmund Feist in 1932, Proto-Germanic was a hybrid language mixing Indo-European (R1b, and to a lower extent R1a) and pre-Indo-European (Mesolithic I2 and Neolithic G2a and I1) elements. This hybridisation would have taken place during the Bronze Age and given birth to the first Proto-Germanic civilization, the Nordic Bronze Age (1700-500 BCE). Finland is not a Germanic country linguistically despite having been part of the Kingdom of Sweden for most of its recorded history until the 19th century. The same is true of the Sami, who retained their linguistic and cultural identity after centuries of officially belonging to Sweden or Norway. Over 60% of Finns and 50% of the Sami belong to the Uralic haplogroup N1c1, which is concordant with the fact that their languages (Suomi and Saami) also belongs to the Uralic linguistic family. One might therefore wonder whether the 25 to 30% of I1 lineages among the Finns and Sami came from their Scandinavian neighbours (notably Sweden) sometime between the Bronze Age and the Middle Ages, or on the contrary whether I1 spread throughout Fennoscandia during the Late Mesolithic/Neolithic period. Of the 28% of I1 in Finland, 65% belong to the exclusively Finnish L287 (downstream of L22) and particularly its L258 subclade. A few percents more belong to other subclades that are also specifically Finnish (e.g. L300). The rest (5-10%) generally resemble more closely Swedish I1. The Swedish-like subclades are unsurprisingly found primarily on the west and south-west coast of Finland, where Swedes have settled in historical times and where Swedish is still spoken. This is also where most of the R1b (3.5%) and Scandinavian R1a-Z282 (3%) is to be found. The Scandinavian I1 in Finland is found at a similar proportion to R1b and R1a as in Sweden. In contrast, Finnish I1 is found in all the country, where hardly any Germanic Y-DNA is present, strongly hints that these specifically Finnish branches of I1 are of pre-Germanic origin. Most of the Sami either belong to the L258 clade like the Finns, or to the L1302 subclade of I1-Z60, a branch more generally associated with West Germanic tribes. L258 is found mostly among the eastern Sami from north-east Norway and Finland, while L1302 is more common in the rest of Norway and in Sweden. The more recent age of I1-L1302 found among the Sami, combined with the higher percentages of R1a (13%) and R1b (7%) and the presence of E-V13 and J2 suggests that some, if not all of the Sami I1 resulted from an introgression in Germanic times, probably through centuries of occasional intermarriages between Sami women and Scandinavian men. Nowadays, approximately half of all paternal Saami lineages are of Scandinavian origin. Finland is the only country with more than 15% of I1 where the Germanic culture and language didn't take root. A good reason for this would indeed be if Germanic culture did not yet exist in Scandinavia at the time when I1 reached Finland. Germanic culture is supposed to have been progressively formed during the Nordic Bronze Age, maturing by the start of the Iron Age around 500 BCE. If only a small group of I1 men spread their Y-chromosomal lineages among the last Mesolithic Fennoscandians, with little or no maternal contribution from the Battle-Axe culture, then their language would most probably have been lost too, as that small number of I1 men joined the northern tribes and adopted their language. 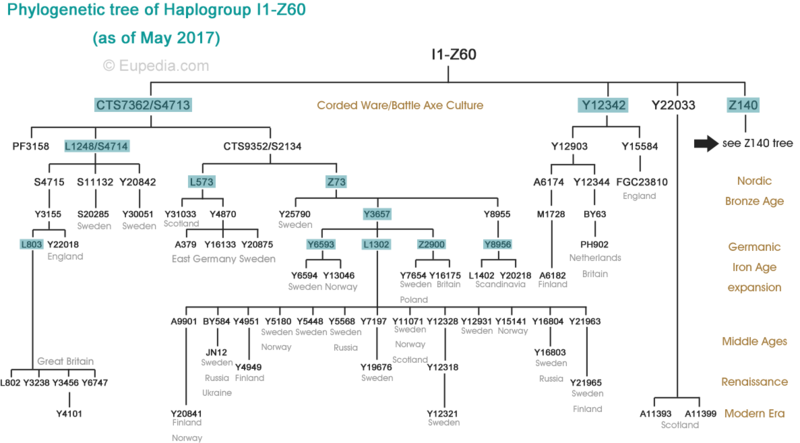 A look at the phylogenetic tree shows that the Finns, Swedes and Norwegians belong primarily to the northern cluster (L22), which is just over 4,000 years old. Out of five subclades, two (L287 and L300) are almost exclusively Finnish, while the others are Scandinavian. According to the Y-chromosomal phylogeny at Yfull.com the L287 and L300 subclades are approximately 3,000 years old. The dates might be older as the number of mutations fails to take into account historical population sizes. Larger populations create more genetic variations. Nordic countries have always had a lower population density than central or southern Europe. Before the Bronze Age, Nordic people were still essentially hunter-gatherers, while the rest of Europe had been farming for up to 3500 years. Agricultural societies could support populations ten times higher than hunter-gatherers in similar climates. In cold Fennoscandia, the pre-Indo-European population density must have been at least 20 times lower than in Mediterranean Europe. This would mean that the mutation rate would also be 20 times lower, and therefore that haplogroup I1 and its subclades could be much older than SNPs and STR variations suggest. If the current age estimates are correct, it would mean that L22 was formed during the Battle-Axe period, while its Finnish subclades would have appeared at the beginning of the Nordic Bronze Age. If the age of the I1 subclades were underestimated, L22 could have arisen during the Funnelbeaker period and spread before the arrival of R1a and R1b in Scandinavia. Whatever the time frame, one possible scenario is that some I1-L22 tribes from southern Scandinavia migrated north, either on their own or pushed by Indo-European invaders. They would have been forced to drop farming by the colder climate in northern Scandinavia, and would have reverted to a hunter-gatherer lifestyle, perhaps with a bit of stockbreeding, just like modern Sami. It's hard to tell whether I1 or N1c arrived first in Lapland and Finland. Both could have arrived approximately 2,500 to 2,000 years ago, I1 getting first to northern Sweden and Norway, then moving into Finland, while N1c would have followed the opposite path, the two groups eventually converging and intermingling to form the ancestors of the Finns. It is possible that various small groups of I1 men joined the remnants of Mesolithic Fennoscandians in northern Scandinavia and modern Finland, and perhaps thanks to superior technology asserted their dominance and became tribal chietftains, quickly spreading their Y-DNA and replacing Mesolithic I2 lineages by I1. That would explain why both the Finns and the Sami have very different maternal lineages from modern Scandinavians, which resemble more those of Mesolithic Scandinavians. All Germanic tribes expanded from a small geographic core around Denmark and southern Sweden within the last 2500 years. STR (short tandem repeats) variations allows to divide I1 members in various categories. There are two main clusters, each with their own subgroups. the Northern cluster, peaking in Norway, Sweden and Finland, which corresponds to the I1a2 (L22+, formerly known as I1d) subclade. It normally has an STR value greater than 22 for DYS390. the Norse group, corresponds to Ken Nordtvedt's Norse (mostly Swedish) and Ultra-Norse (mostly Norwegian and Icelandic) haplotypes. The Ultra-Norse haplotype 1 (I1-uN1) difers from the Norse one by having DYS385b=15 and (usually) DYS449=29. the Bothnian group, is found mostly in Finland and northeast Sweden. It corresponds to I1a2c1 (L287>L258+) subclade, which it makes up 75% of the I1 lineages in Finland. the Southern cluster, most common in Denmark, Germany, the Low Countries and the British Isles. It corresponds to Ken Nordtvedt's Anglo-Saxon haplotype (originally Danish and North German). 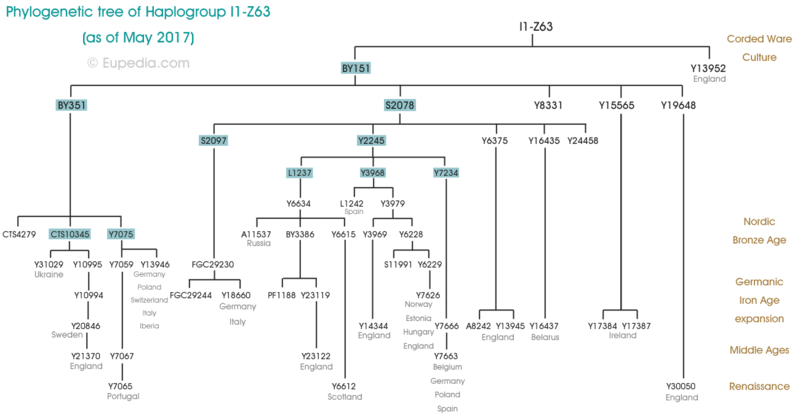 the Danish/Polish group usually has a DYS557 value greater than 15.
the Western group, comprising the Low countries, England, Scotland and Ireland, matches the Z58+ subclade. It probably matches Anglo-Saxon and Frisian/Batavian ancestry. there appears to be a specific Welsh subgroup defined by a GATA-H4 value superior or equal to 11. This subgroup is also found in England and on the continent, but is especially common in Wales. the German group, is the most common type of I1 in Germany, France, Italy and Central Europe, but is also found in the British Isles and to a lower extent in Scandinavia. It is defined by a DYS456 value inferior to 15. It corresponds to the Z63+ subclade. Z131+ is a minor subclade that has been found in areas bordering the ancient Celtic-Germanic boundary (Belgium, central Germany, Bohemia), but also in Sweden and Britain. Z17925+ is a minor subclade found in Germany, France and England. Z19086+ is a minor subclade found in Finland. DF29+ represents 99% of I1 lineages. CTS6364+ is the main Nordic branch, centered mostly on Scandinavia, Germany and northern Poland. Y3866+ is found mostly in Scandinavia. A5338+ is found especially in Sweden and Norway, but has also been found in Scotland (Y17395 subclade dating from 1250 ybp, Viking ancestry). S11221+ is found especially in Sweden and Norway, but has also been found in Hungary. S4767+ was formed 4,000 years ago and immediately split in two clades. Y4781+ is found mostly in Nordic countries. M227+ has been found in Scandinavia, Baltic countries, Belarus, Russia, Poland, Switzerland, France and southern England. It could have been spread by Varangian Vikings. S7642+ is found mostly around Scandinavia and the Baltic. L69/Y18103+ is found mostly in Poland, but also in Denmark, Slovakia, Hungary and Russia. L22+ (aka S142+) is a very big Nordic branch. It is also very common in Britain, especially on the east coast where the Vikings settled most heavily, in the Low Countries and Normandy (also doubtlessly the heritage of the Danish Viking), as well as in Poland and Russia (Swedish Vikings). P109+ A mostly southern Scandinavian subclade, with a presence in all the regions settled by the Danish Vikings. It has been found sporadically in many parts of Europe, such as western Iberia, northern Italy, the Balkans, Lithuania and Russia. S10891+ is found mostly in Sweden and Norway, but also in Normandy and the British Isles (Viking ancestry) as well as in northern Italy (FGC21732 subclade). Y4045+ is found in England and Ireland (Viking origin). S14887+ is found mostly in Denmark, Sweden and Finland. FGC22045+ is the main variety of I1 found in Serbia (7% of the population), probably of Gothic/Gepid origin. Y3664+ is a minor clade found in Denmark, Schleswig-Holstein, Normandy and Guernsey (Viking origin). Y5621+ is a minor clade found in Sweden, Normandy and Britain (Viking origin). Y14999+ is a minor clade found in France and Britain. L205+ is mostly limited to the Low Countries, France and Britain. Isolated cases were also identified in Sweden and Spain. L287+ is an overwhelmingly Finnish subclade (found nation-wide), with a very small presence in Norway, Sweden, Poland and Russia. L300+ is a minor subclade found almost exclusively in southern Finland. L813+ is a predominantly Scandinavian subclade, particularly common in southern Norway, but also found in Sweden, and to a lower extent western Finland. It is also found in Britain (likely of Viking descent) and in the northern Netherlands (but not in Germany). Z138+ (aka Z139+) is a very disparate subclade. It is found at very low frequency throughout the Germanic world, with a peak in England and Wales (although it could just be because of oversampling in Britain). Besides Germanic countries, it has also been found in Ireland, Portugal, southern Italy, Hungary and Romania. Z138+ corresponds to AS2, AS10, AS1010.2, AS10910, AS1221, AS1414 and Esc-13 in FTDNA's STR-based nomenclature. Z138 is divided in four subclades: S2293 (the largest), S5619, PF1610, and PF2364. S2293+ was formed 4,500 years ago and immediately split in two branches: S6277 and Z2541. S6277+ is found in Scandinavia, Britain, France, Germany, Austria and Italy (Torino, Matera, Reggio di Calabria). S2268+ is found in Ireland, Britain, the Netherlands, Germany, Denmark, Norway, Austria and Hungary. S19185+ is found in Britain, Ireland, Norway and Hungary. Y7043+ is the largest of the Z2541 subclades. It is found from Norway to northern Italy (possible Lombard connection) via Germany, Belgium and Switzerland. Y21391+ has been found in Luxembourg. Y29668+ is a minor clade found in England. Z59+ is the main branch of Z58. Z2040+ formed 4300 years ago and split into two clades around 3900 years ago. Samples negative for L1450 and Z382 were found in Norway, Finland and Russia. L1450+ is a small clade scattered in Norway, Germany, Poland, Bulgaria, Slovenia, Switzerland, Britain and Ireland. Z382+ has been found especially in the British Isles and Germany, with a minor presence in Scandinavia. Isolated samples were also identified in Finland, the Netherlands, France, Italy, Croatia and Romania. corresponds to AS3, AS3-911, AS13 and Sw in FTDNA's STR-based nomenclature. S26361+ is found mainly in Sweden and Norway. S16414+ has been found in Norway and in Sardinia (YP5417+, TMRCA 1750 ybp), where it could have been brought by the Vandals. Y2170+ is found in Germany, Britain, Scandinavia and Russia. Y5384+ is found in Finland and Italy (Rome). Y12342+ is a small clade found mostly in Finland, but also in England. Y22033+ is a minor clade found in Scotland. Z140+ is a strongly West Germanic subclade, found essentially in the British Isles, the Netherlands (one third of all I1), northern France, central and southern Germany, and Switzerland. It is very rare in Nordic countries. Isolated samples were found in Spain, central and southern Italy, Slovenia, Bohemia, Poland, Ukraine and Russia. Z140* matches the AS5, AS6, AS814 and EE haplotypes in FTDNA's STR-based nomenclature. A196+ is found in Sweden, Germany, Switzerland, Austria, Hungary, France, Portugal, England, Wales, Scotland, Ireland, Belarus and Russia. A1605+ is a minor clade found in the Netherlands and Britain. BY477/Y15150+ is small clade found in Germany, Britain, Ireland, Portugal and Spain. CTS8691/F2642/S2169+ is a large clade found especially in Scandinavia, Germany and Britain, but also in Finland, the Netherlands, Switzerland, Poland and Ireland. Y6232+ is found in central Europe, Britain and Italy. Y7277+ is found in Germany, the Netherlands, England, Czechia, Switzerland and Italy. It could be related to the Lombards. Y10890+ is found especially in central/southern Italy near places settled by the Lombards (Ortona, Alifae, Campobasso) and the Vandals (Trapani). Z2535+ is a very large clade found in Scandinavia, Britain, Germany, Czechia, Poland and Romania. L338+ is a large subclade found in Germany, the Netherlands, Norway, Britain, Switzerland, Poland and Romania. It typically has the STR value GATA-H4=9. L338+ is divided in several subclades which correspond to AS1, AS1H, AS8, AS114 and AS11616 in FTDNA's STR-based nomenclature. Z73+ (and L1301+) is chiefly northern Scandinavian and Finnish. It is also found in Russia, on the east coast of Britain and the Scottish Isles (Viking heritage). Z73+ corresponds to AS9 and AS16 in FTDNA's STR-based nomenclature. L1302+ is found chiefly in Sweden, with a few subclades in Finland and Norway (BY495), and a few isolated samples indentified in Scotland and Russia. L573+ appears to be mainly a Northeast German subclade, but it has also been found in Belgium, France, Sweden, Poland, Lithuania and northwest Russia. L1248+ is a minor subclade that has been found in Sweden, Britain, Germany and Russia. L803+ has only been identified in Scotland. Z63+ is a strongly Continental Germanic subclade, virtually absent from Nordic countries. It is most common in Central Germany, the Benelux, England, Lowland Scotland, as well as Poland. It has also been found in Russia, Ukraine, the Balkans, Italy, Spain and Portugal. S2078+ is a widely distributed clade found across most of Europe, but is relatively rare in Nordic countries, in the Benelux and in the British Isles. Y2245.2+/PR683 makes up a big part of the Z63 in Russia, Ukraine, Poland, the Balkans, Italy and Iberia. It is also found in the UK, Sweden, France, Germany, the Czech Republic, Bosnia, Albania and Lebanon. Some subclades could have been spread by the Goths. L1237+ is found in Sweden, Poland, Ukraine, Russia, Serbia, Bosnia, Czechia, France and northern Italy. Could be of Gothic origin. The A8249 subclade is found chiefly in the UK, while the very young (850 ybp) Y8815 subclade is found exclusively in Scotland. Y3968+/S10360+ is found in Scandinavia, Finland, Germany, England, Poland, Ukraine, Russia, Hungary, Italy, Spain and Portugal. Not exclusively Gothic, but was surely found among the Goths. Y7234+/FGC14480+is found in Poland, Germany, Belgium, France and Spain. S2097/Y4102+ > FGC29230+ is found especially and Spain (Catalonia, Madrid, Extremadura) and Italy (Lombardy, Sicily), but also in Germany. Could be of Gothic origin. Y6375+ is found in Britain. Y16435+ is found in Serbia (second most common subclade after FGC22045). V68+ is found in Belarus, Serbia and Kosovo. BY351+ is a subclade found in Poland, Ukraine, Croatia, Italy (including Sardinia), France, Spain and Portugal. It was very probably spread by the Visigoths and Ostrogoths. The personal genomics company 23andMe tested the Y-chromosomal haplogroup of business magnate and multi-billionaire Warren Buffett (born 1930) and singer/film producer Jimmy Buffett (born 1946) to determine whether they shared a common patrilineal ancestor. Both men were found to belong to haplogroup I1, though apparently not to closely related subclades. Snorri Sturluson (1179–1241) : was an Icelandic historian, poet, and politician particularly know for writing the Prose Edda, an important work relating to Viking history and Norse mythology. His presumed descendants tested their Y-DNA haplogroups, which is available on YSearch.org (KCV4E, M7MRC). Emanuel Swedenborg (1688-1772) : was a Swedish scientist, philosopher, theologian, revelator, and mystic. The subclade of the Swedenborg noble family was identified by Jacob Norstedt as I1-BY223 (aka Y5180), downstream of Z60 and Z73. Buckminster Fuller (1895-1983) : an American architect, systems theorist, author, designer, and inventor. He was the second World President of Mensa from 1974 to 1983. Kenneth Leon Nordtvedt (born 1939) : professor emeritus in the Physics Department at Montana State University and a senior researcher specializing in relativistic theories of gravity. He is a well known researcher in the genetic genealogy community. Bill Griffeth (born 1947) : an American financial journalist from CNBC, the cable network he has been with since 1991. Djavan (born 1949) : a Brazilian singer/songwriter. Djavan combines traditional Brazilian rhythms with popular music drawn from the Americas, Europe and Africa. Björn Wahlroos (born 1952) : is a Finnish millionaire known for his controversial ideas. He is the Chairman of the Board in Sampo Group, Nordea and UPM-Kymmene. Sergei Lukyanenko (born 1968) : is one of the most popular contemporary Russian sci-fi writers. Nasir bin Olu Dara Jones, known by his stage name Nas (born 1973) : an American hip hop recording artist, record producer, actor and entrepreneur. His haplogroup was revealed by the PBS TV series Finding Your Roots. He is the son of cornetist, guitarist and singer Olu Dara.